Comforting Chicken Alfredo Tortellini Soup recipe where the flavors blend together so well everyone will be begging for seconds! The Parmesan Alfredo sauce is the special ingredient that makes this hearty soup rich and creamy. I have one amazing soup recipe for you today. No. Seriously. It’s one of the easiest and absolute best tasting. It’s warm, creamy, cheesy, comforting and even has some delicious veggies. I made this on one of the first very cold days of the fall and it really hit the spot. However, I definitely don’t discriminate when it comes to soup. I’ll eat it pretty much any time of the year. My absolutel favorite (and apparently my readers’ favorite as of lately) is this Copycat Panera Chicken & Wild Rice Soup. So, what to eat when comfort food sounds too heavy and soup sounds too light? This Chicken Alfredo Tortellini Soup, obviously! If you’re wondering where I got this winning soup recipe, I’m so excited to tell you about a brand new cookbook, The Simple Kitchen, my friends Donna and Chad from The Slow Roasted Italian came out with. They have a stellar blog packed full of delicious Italian recipes…and you all know my love for Italian food. They really put out some great content and their photos are beautiful. 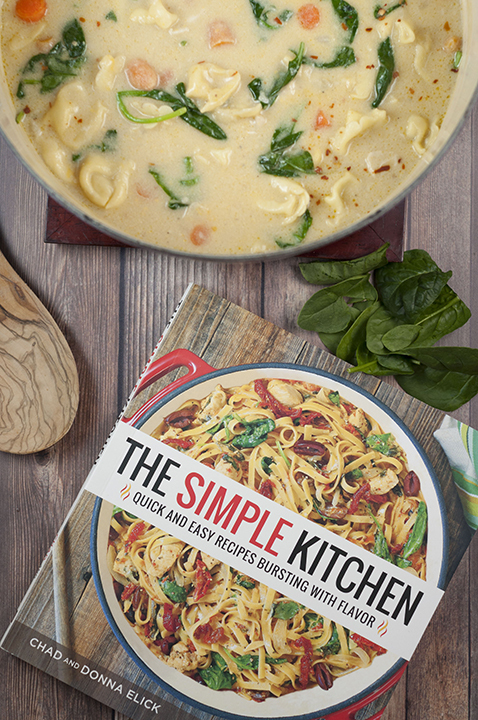 This Chicken Alfredo Tortellini Soup can be found on page 112 of their new book. I had the pleasure of meeting Donna and Chad in person years ago at the BlogHer Food Miami conference. They are two people who are excited about what they do – it’s not just a job to them. That’s how I aspire to be as a food blogger. They are always willing to give advice and help out their friends. I’m lucky to know them! I’ve made countless recipes off of The Slow Roasted Italian blog in the past, but now I’m excited to have this new cookbook full of their best and newest recipes. Inside The Simple Kitchen are 8 chapters and each chapter has over 10 tried-and-true easy recipes. There are also a lot of kitchen tricks and techniques scattered throughout the cookbook that are very helpful. I know you guys will love this one and I hope you try it out! The recipes are perfect for busy weeknights. Hey, it would also make a great Christmas gift. 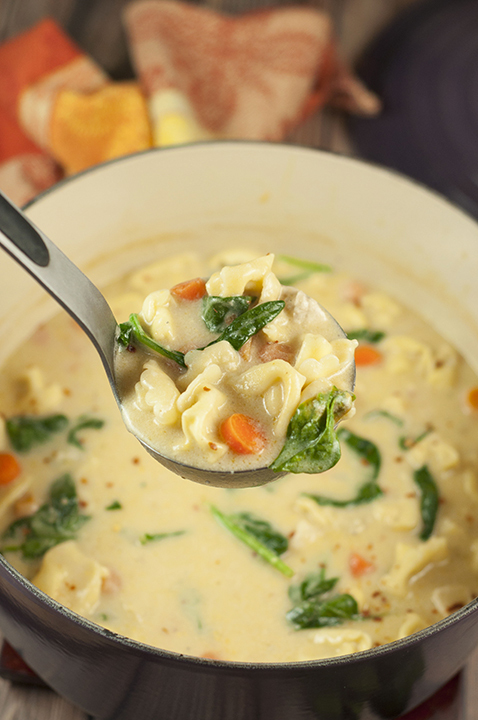 Give this hearty Chicken Alfredo Tortellini Soup a try soon and remember to save room for seconds! You are going to need it. 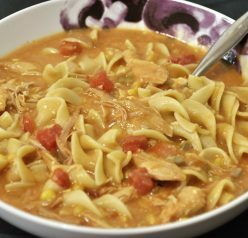 Chicken Tortilla Soup – this soup is so flavorful and topped with crunchy tortilla strips! Best Italian Wedding Soup – Mini meatballs and fresh vegetables make up this easy comfort food for cold nights! Creamy Broccoli Cheddar Soup – this tastes just like the soup at Panera Bread! 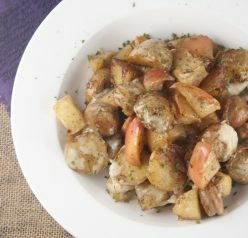 Serve it for lunch or dinner with a side of crusty bread! Chicken Alfredo Tortellini Soup recipe- the flavors blend together so well everyone will want seconds! Parmesan Alfredo sauce makes this soup rich & creamy. Heat a large pot or Dutch oven over medium-high heat; add butter and melt. Add onion and carrots; cook until onions are translucent (3-4 minutes). Add chicken, salt, and pepper; stir to combine. Cook for 3 minutes - you want just a little color on the chicken - stirring occasionally. The chicken will cook the rest of the way as the soup cooks. Sprinkle flour over the chicken/veggies; stir to coat. Cook for 2-3 minutes. Stir in chicken stock, half and half, and red pepper flakes. Cook until soup thickens (5-10 minutes). Add tortellini to pot and cook until al dente, 5-7 minutes (if frozen, this will take longer). Remove pot from heat. Sprinkle in half the cheese and stir until melted. Stir in the rest of the cheese and melt slowly. Add more salt/pepper to taste. Pour into bowls and garnish with spinach. (You can also stir in the spinach while it's still in the pot. Enjoy! This is not a sponsored post, but I did receive a cookbook from Donna and Chad for review. All opinions are 100% my own, as always. I’m anxious to try this soup but you left out the amount of chicken stock needed. Thanks for your awesome recipes. I have enjoyed making so many but have to admit your chicken pot pie is my all time favorite. Oh my gosh thank you! I will fix that today. Yeah that pot pie is my favorite too! Oh wow – this looks like it would be a huge hit at my house. 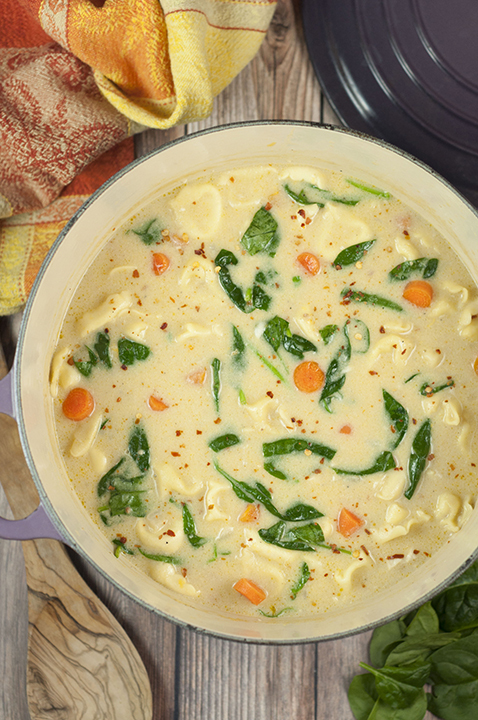 We already love tortellini and creamy soups, so it makes perfect sense to marry the two together into this epic soup! I can’t wait to try it! We’re eating soup several times a week, so we’re always looking for new recipes. Wow, this one looks amazing! Really creative — thanks. Ashley, it is beautiful! Thank you so much for your review. I am so happy you love the book. Creamy soups like this are soooo good in this weather!! My fam would love this! Looks so good! I am obsessed with soup right now, so will have to add this to the mix. I guess it is that soup time of year with the change in weather. Mixing Italian foods and soup is pure perfection. This is my kind of comfort soup, it looks so good! I just tried it and it worked for me. Sorry, Renee! Would vegetable stock be ok to use? 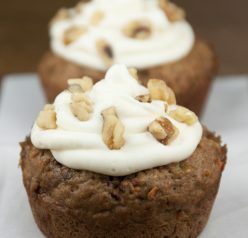 Want to make this meatless for lent! I made this for dinner last night. It was great. It will certainly be added to my list f favourites.